Coming at you with another low carb breakfast to start your day! One that requires little prep, few ingredients, and is packed with TONS of kick as flavour. Pepper Prep: Start out by prepping your bell peppers: slice them in half lengthwise and cut out the inner white membrane and seeds. Arrange in a large baking dish, cut side up and set aside while you make the filling. Filling Prep: Warm the olive oil in a large skillet. When the oil is hot, add your onion and cook about 5 minutes to soften the onion. Once softened, add the sausage meat and cook until no longer pink. Stir in the spinach until wilted and then remove from the heat. In a medium sized bowl with a pouring spout or measuring cup, whisk together the eggs, salt, pepper and 1/2 cup of the cheese. 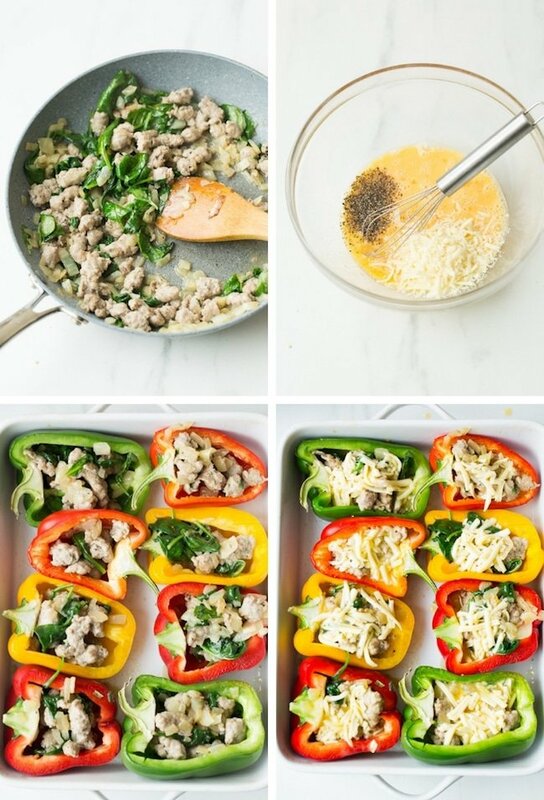 Putting it all together: Spoon the sausage mixture evenly into the open bell peppers. Once ever pepper has been filled, carefully pour the eggs over the top of the sausage and then follow on with the remaining 1/4 cup of cheese. 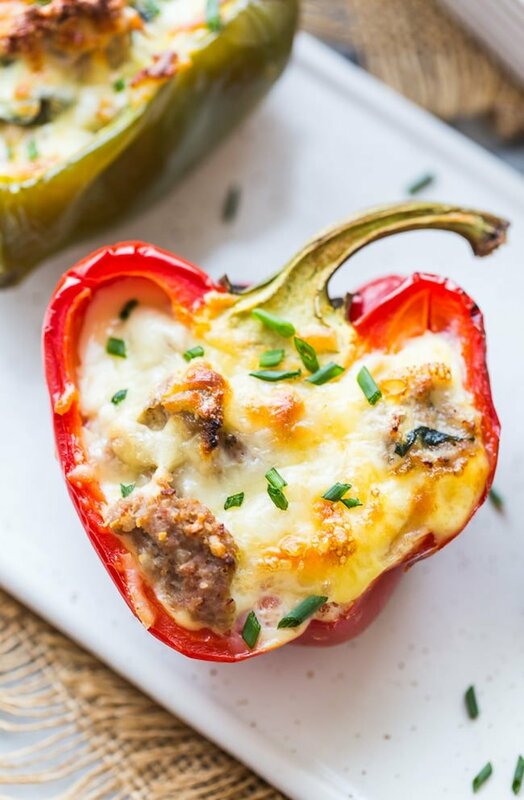 When you’re ready to go, pop the peppers in the oven and let cook about 30-35 minutes or until the egg filling has set and the cheese has melted and gone golden. Is there a difference between different bell pepper colours? Yes! While they all grow from the same plant the main difference is that red peppers are ripened the longest on the vine and green the least. Once picked bell peppers don’t really ripen any more. Red bell peppers are the sweetest, followed by yellow and orange and then finally the green peppers. Whichever you use is entirely up to you and your own personal tastes. Which bell pepper is the healthiest? Red peppers tend to be the most nutrient packed since they have more time to grow on the vine. They contain almost 11 times more beta-carotene and 1.5 times more vitamin C than the green. Kept stored in an airtight container you can keep these stored in the fridge for up to four days. Yes! Once cooked let these cool completely before wrapping well in foil. Then just pop them in the freezer and store for up to 3 months. Keep in mind though that the peppers will be much softer after being defrosted from frozen. 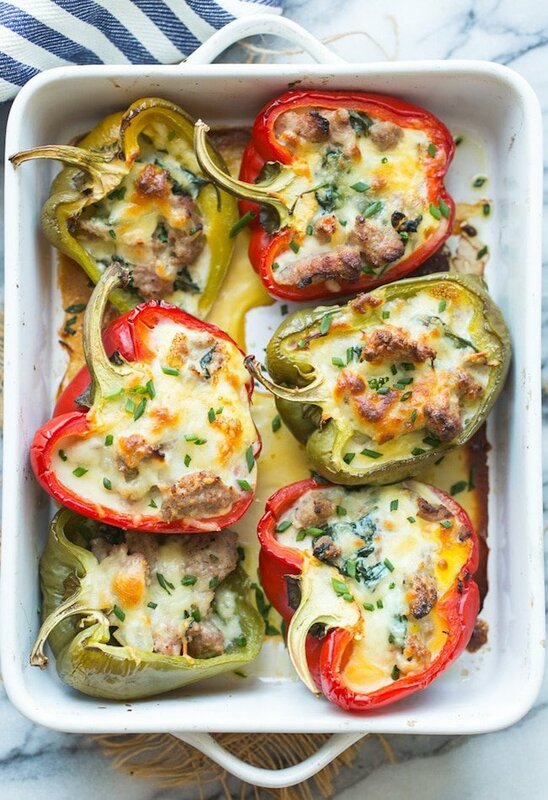 Don’t forget to #asaucykitchen on instagram if you try these Breakfast Stuffed Bell Peppers! We love seeing what you make! You can also post your pictures to my facebook page! Preheat oven to 350°F/180°C. Lightly grease a 9x13 baking dish. Warm the olive oil to a large skillet over a medium heat. Add the onions and cook about 5 minutes to soften. Add the sausage and cook until no longer pink. Stir in the spinach and cook an addition 1-2 minutes until wilted. Remove from the heat. In a medium sized mixing bowl whisk together the eggs, salt and pepper. Stir in 1/2 cup of the cheese. 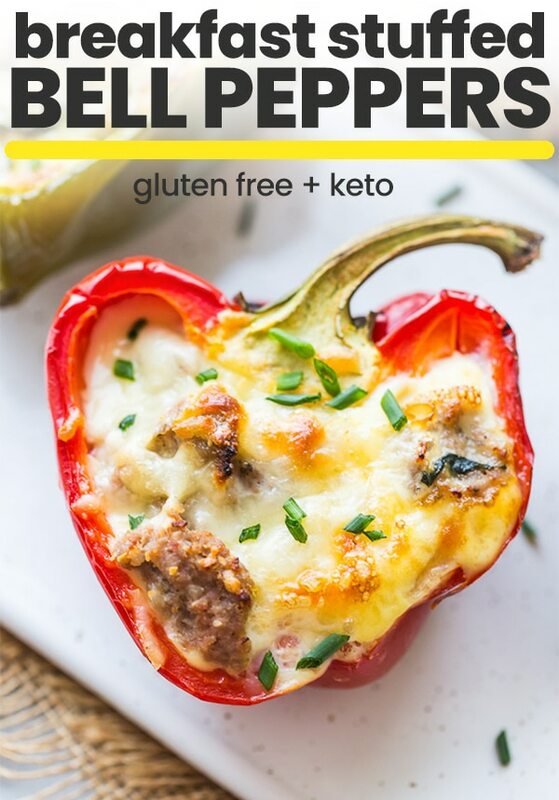 Remove the bell peppers from the oven. Spoon the sausage mixture evenly into each pepper. Pour the egg mixture over the top of the sausage. Top with the remaining 1/4 cup cheese. Return to the oven and bake an additional 35-40 minutes until the cheese has goldened. My new Monday morning breakfast! (Sunday and Monday are my weekend). I put the peppers in the oven to roast while I did chores (takes about 15 minutes), then made the filling when I was done. Wrapped and froze up the leftovers….yummy lunches and breakfasts await! Will be growing more bell pepper plants this summer! 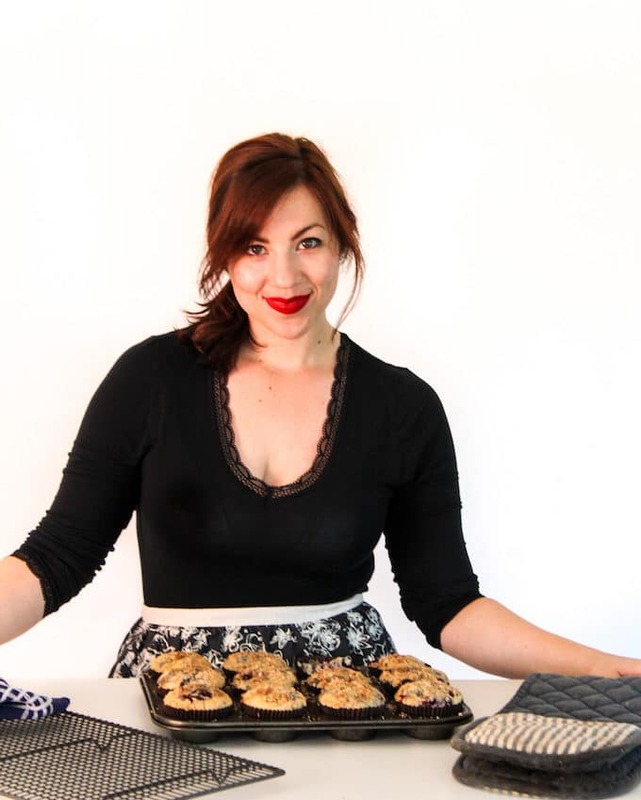 I just discovered this site and am in LOVE with the recipes! I wouldn’t mind waking up to this for breakfast! Yum!